Waterless/Clean Agent Systems provide protection for facilities containing valuable corporate assets from people and processes to equipment and software. Clean Agent System like IG 300 bar, HFC 42 Bar, CO2 High Pressure provide protection for facilities containing valuable corporate assets from people and processes to equipment and software. The agents discharge as a gas, reaching into all areas of the protected facility and leaving no residue to damage sensitive equipment or require costly cleanup. They combine the benefits of clean agent systems and active fire protection with people-safe, environmentally friendly performance. EUROGARDIAN srl is specialized in gas fire extinguishing systems. 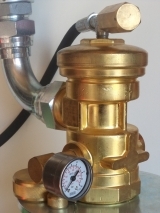 The components of our fire suppression systems ( valve, gas cylinder) are designed and producted in-house. All product are cerified under the EN12094-series standards.